Casaroli served as the Vatican's Foreign Minister under two different titles. From 1967 he headed the Congregation for Extraordinary Ecclesiastical Affairs, and then from 1979 until his retirement in 1990 he led the Secretariat of State, the new name for the Vatican's Foreign Ministry. ♦ Excerpt from Peter Hebblethwaite, "From Ostpolitik to Europapolitik"
The first excerpt, by Peter Hebblethwaite a former Jesuit and top Vaticanologist, outlines the Vatican's three diplomatic stages with a country in achieving the "full existence" of the Church there, (which, of course, implies obtaining concordat privileges). Casaroli pursued a "small-steps diplomacy" and his memoirs are titled The Martyrdom of Patience. This excerpt also shows how the charismatic John Paul II toughened up the diplomacy of the cautious Casaroli in the pursuit of the Vatican's Ostpolitik, (its dealings with the Communist countries of Eastern Europe). Perhaps Casaroli's most enduring legacy in more than sixty years of serving the Church was his contribution to the Helsinki Conference, a landmark in the process of détente. European Journal, N. 11, 1/1991, pp. 62-64. In 1978, there came the surprise of a Polish Pope. Many observers said a Polish Pope was impossible. [...] The election of a Polish Pope made an immediate and dramatic difference to the Vatican's Ostpolitik. Then there was the first visit to Poland in June 1979. [...] The Polish government certainly had the physical means to keep the Pope out: but in practice it could not stop him from going home, much less censor him once he was there. Quite a bit has been made of the way his first visit gave Poles the self-confidence which led to the formation of Solidarity the following year. 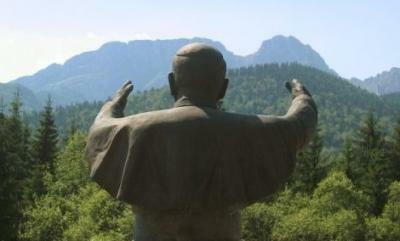 John Paul acted as the tribune of the people. He articulated their aspirations. Reviving the theme of the millenium celebrations of 1966, he claimed that the church embodied the soul and the culture of the Polish nation in a way that the party could never aspire to. At Gniezno Pope John Paul II proclaimed the "spiritual unity" of Europe. [...] Why Gniezno? It was there that the first Polish King, Miesko, was baptised in 966: so the baptism of the king and the birth of the nation coincided. At Gniezno in June 1979, he proclaimed the spiritual unity of Europe, and said that it was to proclaim this unity that Providence had chosen a Slav Pope. It is difficult for mere politicians to argue with divine Providence. This short biography from a Polish encyclopaedia focusses on Casaroli's role as roving ambassador in Eastern Europe from 1961 until 1979 when he was rewarded with the number two job at the Vatican and became Secretary of State. 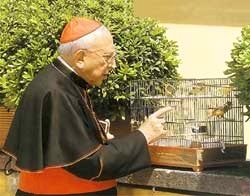 Agostino Casaroli (1914-1998), cardinal, Vatican diplomat. He studied Canon Law [in the seminary in Bedonia, at left], then graduated from the Pontifical Ecclesiastical Academy, training personnel for the Secretariat of State, where he began work in 1940. He designed the Vatican's Ostpolitik, initiating the policy of establishing contacts with the communist countries of Central and Eastern Europe. In 1964 he signed a partial agreement with Hungary, which normalised the situation of the Catholic Church in that country, and was the first formal agreement between the Vatican and a communist country. In 1965 he negotiated a similar agreement with the government of Czechoslovakia, and in 1966, with Yugoslavia. In the '60s he began to travel to Poland, leading the negotiations mostly on the legal status Catholic Church on the "Recovered Lands" [the territory taken over from Germany when Poland got shoved westward after WWII. These bore fruit in 1971 when the Catholic and other churches got legal title to the lands that they had been administering on the Western and Northern Lands]. In  he was appointed cardinal and Secretary of State of the Vatican City State — a function he held until 1990, when passed into retirement, while Deputy Dean in the College of Cardinals. For almost 50 years he was involved in the care of minors and criminals in one of the suburbs of Rome.